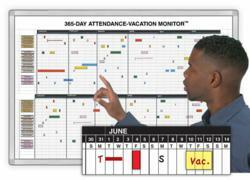 Magnatag’s new magnetic 365-Day attendance and vacation monitor whiteboard shows employee absentee patterns and reduces vacation conflicts, from Magnatag Visible Systems. “Our customers tell us this board is a powerful motivator. They say displaying everyone’s attendance makes it easy to spot abusers and creates peer pressure to improve” says Magnatag spokesperson Christian Krapf. The Attendance Tracker arrives ready to use with magnets and everything needed to operate it. Lines and lettering are heat-fused printed and can be customized as you order on line. For more information go to http://www.magnatag.com/ATTEND or call 800 624 4154 and talk to a visible systems specialist. Magnatag® Visible Systems, designs, manufactures and direct-markets over 2,300 magnetic printed whiteboard kits, calendar planners, maps, custom boards, WhiteWalls, RotoCube Bulletin Towers, magnets, whiteboard accessories and other information display systems for industry, hospitals, schools, business and government. A veteran-owned family company founded in 1967. See their website at http://www.magnatag.com.